We are specialized in manufacturing, exporting, and supplying of Hydraulic Cylinders. Designed to precision, the Hydraulic Cylinders that we provide is a mechanical actuator, which is used to give a unidirectional force through a unidirectional stroke in engineering vehicles. Fabricated with the help of the highest grade raw materials, the Hydraulic Cylinders offered by us are very sturdy and are free from rust. 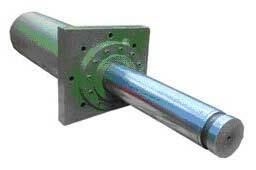 The clients can avail this industrial grade Hydraulic Cylinder at very reasonable rates in the markets.